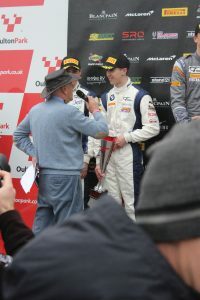 BRITISH GT4 DEBUT PODIUM DRAMA AT OULTON PARK! Motorsport has the amazing capacity to lift you to the highest of highs only to bring you back down to earth with a bump…. or a splash in the case of this weekend’s British GT Championship for Bedfordshire’s Ben Tuck. At an action packed and rain soaked season opener at Oulton Park in Cheshire this weekend, Ben and his co-driver, Ben Green, scored a superb podium in their debut only for it to be snatched away due to a pit stop infringement penalty. 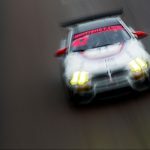 The 21 year old Bedfordshire racer has stepped up to the prestigious and fiercely competitive British GT Championship for 2018, after a stellar year in 2017, where he scored wins in his GT4 debut and his International 24H Series Prototype debut as well as making his British GT Championship debut in the GT3 category. 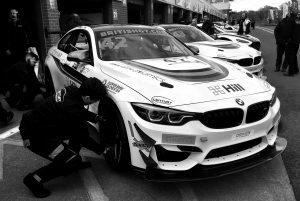 This year Ben will compete the season in the GT4 category for Warwickshire based GT team Century Motorsport alongside his co-driver Ben Green in the BMW M4 GT4. The pair will share the Munch marques latest offering across the 7 event season, which features driver changes and refueling pit stops and races up to 3 hours long. With only a very limited opportunity to test the car, the team wasn’t sure what to expect from their pair of BMW’s. As qualifying got underway it was clear that both the cars were capable of encouraging pace in the damp conditions. Ben Tuck quickly got the #42 car up to speed and took 4th place against a field of 22 cars, which would determine the cars starting position for Race 1, with the sister #43 BMW finding 3rd on the grid. Race day was set two days later on Bank Holiday Monday, which dawned under heavy rain. The rain persisted meaning that the race was started under Safety Car conditions, making 4 tours before releasing the cars to race. On the first flying lap, Ben struggled to get heat into the tyres and slithered wide at Cascades corner dropping him down to 11th place. He then set about an incredible recovery making up a position on every lap but one, lapping up to 2 seconds faster than the rest of the GT4 field and quicker than many GT3’s in treacherous conditions. By Lap 15 Ben pitted from 2nd place having set the fastest GT4 lap by that point. From then on, Ben’s co-driver, Ben Green took to the track and was able to perfectly manage the gap to the 3rd placed car to ensure an incredible debut podium for the pair. 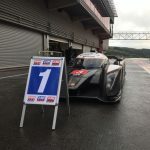 Ben Tuck was delighted with the result: “Going into this weekend we were concentrating on managing expectations around a track we thought we might struggle at. However once we had worked on the set up of the car and heading into qualifying with new tyres, the car was transformed. We were also unsure of what our pace would be like in the wet due to lack of testing, but again the car felt great and after my mistake at turn 2, the pace of the car was very surprising and I had loads of confidence to be able to push hard and make up the places that I had lost. It was an awesome feeling finishing P2 in the race with Ben Green”. Celebrations were cut short, however, when word arrived that their pit stop was just half a second shorter than the minimum time allowed, incurring a 30 second time penalty and demoting the pair down to 7th place. After the disappointment, all eyes turned to race 2 to repeat the performance. In a second blow, race 2 was abandoned on safety grounds due to the continuing very heavy rain. Ben next races at Rockingham in Northamptonshire on 28th and 29th April, which will be the more traditional single 2-hour race.